There is a debate in the basketball community about whether to dip the ball or not dip the ball when shooting. I hope to offer a different perspective and show reasons why both sides actually have vital points that are relevant to developing great shooters. Also by understanding this VITAL shooting fundamental (it’s not the dip) that very few people teach, you can greatly improve your shooting. Until I met Rick Penny a few years back, I never heard anybody talk about this key fundamental. At first, I actually ignored teaching this part of the shooting process because I did not think it was important. Was I wrong! But first... I want to tell you a little story about my process and how I finally had my “Ah-Ha” moment. As I believe many of you might be able to relate to this process and might have experienced the same issues. When I first started teaching shooting, I was fortunate to talk to a shooting coach named Tom Nordland. Tom asked me “When you watch great shooters shoot during a game, do they dip the ball?” So I went back and watched great shooters at all levels. A very high-percentage shooters, but not all, did dip the ball below the shoulder/chest area. Most of them dipped the ball to an area around their waist. I believed it was a rhythm thing that players naturally did. How many of these great shooters dipped the ball because they taught that? Very few, if any. I lacked confidence on how to teach it. The dip I saw being taught was different than what I saw being used, but I couldn’t put my eye on what it was at the time. Part of me wondered if teaching this would exaggerate the dipping motion. There were also situations that they shouldn’t dip the ball. Catching the ball at the waist level. Picking the ball up off the dribble. Shots inside of 12 feet (a step inside of the free throw line). And I didn’t want to give the players something extra to think about if they already naturally did this. So I figured just by eliminating, “Don’t dip the ball” from my vocabulary, it would take care of most of the issues I saw. Looking back, I learned some of these worries were valid. Some were not, but for different reasons. While my approach worked for the most part... I was still running into a percentage of shooters... a rough estimate of 20% to 30% of shooters...that were rigid and stiff and not very accurate shooters as they were consciously trying not to dip the ball. At the same time, I would see a few shooters who did not dip the below the shoulder/chest area and were very good shooters. This confused me. Were these kids never going to be good shooters? Is it because they weren't dipping the ball? Should I be teaching the dip? Is it something completely unrelated? Is it anatomy? Is it genetic? Is it something the human mind can't comprehend, understand, or use words to describe? So with these players, I started teaching players to catch, drop the ball to their stomach/waist level and shoot the ball. This really helped with the fluidity of the shot. They didn't look stiff or rigid anymore. You could tell that it relieved tension and improved rhythm. HOWEVER... I noticed a few things. In some cases, the way I taught the dip made some shooters worse. As mentioned before, if I wasn’t careful with the dip, it became an exaggerated motion. This dipping motion was different than the good shooters I studied. The good shooters were still very compact with the shot motion and I felt like my shooters were not. For players that already catapulted, the dip exaggerated the catapult even more creating a flat, inaccurate shot. The picture to the right and the video below is an exaggerated catapulting motion. I actually would put my hand next to their head to give them instant feedback when they were catapulting the ball too much. This worked temporarily, but they would still go back to their old shooting habit of catapulting the ball. The timing and coordination just looked off in some of these shooters. The shots looked rushed. At this time, I was using the phrase, “Ball up. Legs Up.” I said to the players that you should jump and bring the ball up at the same time. Looking back, this was actually creating what I call the Shawn Marion effect. Just recently, I incorporated a new shooting fundamental to my shooting process and shooting progresses that dramatically fixed my shooting issues. I believe this is the missing link between the dippers and the non-dippers and can dramatically help both. We believe it’s so important that we’re adding this to our curriculum for our shooting camps to include this new shooting fundamental and shooting progressions to teach it. I had seen this missing link 4 or 5 years ago, but for some reason I didn’t think it was important to teach in the shooting development process. It was from Rick Penny’s One Motion Shooting Video. We thought Rick’s shooting video was so precise and well taught that we actually added it to our store. Rick uses the terms Tuck and Set to describe important points in the shot process to help with teaching the proper timing and coordination. Tuck is a position when the player brings the elbow back with the ball around the stomach to waist area. At Tuck, the forearm is parallel to the floor and elbow/upper arm is angled slightly back. Set is the position when the ball is front of your shoulder. From my experiences and understanding, this is traditionally where the non-dippers want you to start the shot motion process. The ball will transition from Tuck to Set to the shooting release in a fluid, constant motion. Your goal is to remove all hitches and pauses in the shooting motion. It has to do with the transition of Tuck to Set. It is coordination and timing of the legs extending & jumping during the shot motion. When the player moves the ball to the Tuck position, they immediately start to raise the ball to the Set position. However, they do not start to extend their legs right away. The hips are still down. Only when the ball path reaches the Set position, should the players start to extend their legs and jump. So the ball is actually already moving upwards before the player starts to jump. However, there are no pauses in the shot motion. It is one fluid motion from Tuck to the release. Here is a picture of Stephen Curry at Tuck. Notice the arm angle and how it's very close to 90 degrees. The arm angle stays consistent until the release motion starts. The elbow is also tucked back by the side. At times during games, Stephen will drop the ball a few additional inches to his hip level. For my students, that's close enough and I wouldn't adjust it. Below is a picture illustration of Stephen Curry's shot motion. The only thing missing from the picture is the Tuck. In the second picture from the right, you'll notice that he is bringing the ball up to Set, then he starts to extend his legs and jump as the ball reaches Set. I also recommend you go watch his shot in slow motion on YouTube. So my phrase “Ball up. Legs up.” and the timing that I taught was screwing up some shooters because they literally did what I was teaching. Since the players were starting their jump from the Tuck position rather than the Set position, the upper part of the shot motion was rushed to keep up with the timing of the jump. This was the Shawn Marion effect I referred to earlier. However, when I video recorded the best shooters I worked with, they were naturally incorporating the correct timing despite my faulty teaching. This is where the non-dippers were exactly right about the importance of the Set position! They saw that the ball was always in this position as the player started to extend their legs to jump. And the dippers were right about relieving tension and rigidity and improving rhythm and fluidity. The timing of the legs extending at the same time as the ball moved upward from Tuck to Set through the release. And a very precise motion of dropping the ball with the Tuck. The issues previously mentioned that I had with the dip were fixed. The exaggerated dip was eliminated because the Tuck was very precise and told you where to bring the ball prior to starting the shot process. When a dip wasn’t needed, it wasn’t used. As you can probably see, the Tuck is easy to teach. When I started teaching the dip, the catapulting motion even became more exaggerated. This happened because players were starting the ball too far away from their body. It was not in the Tuck position. Then when they brought the shot up, the inertia created negative motion backwards. Thus, the ball came behind the head or to the side of the head even more.... creating a flat, inaccurate shot. So when I added Rick Penny’s Tuck, the ball was brought in closer to the body which eliminated the catapulting motion. The Tuck created better arc. Because the ball started closer to the body with the Tuck, the path of the ball naturally went up and out as shown in Rick’s video above. Due to the starting position and the motion of the shot, it naturally gave players the optimal arc. Opposed to traditional thinking, I also found due to a quicker release, a higher release point, and more arc on the flight of the ball, it was harder to block the shot. 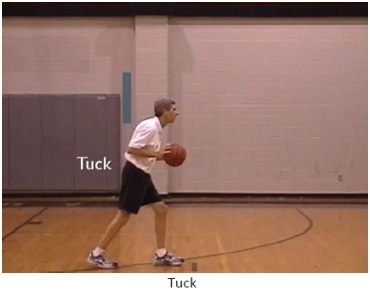 The Tuck also relieved tension and improved the rhythm and fluidity of the shot which is the reason most people use the dip. When the Tuck is added to the proper timing and teaching progressions, you develop a quick, smooth shot motion that is highly accurate. I don’t how else to say it.... You just look like a shooter. Of famous shooters, this shot motion is most-related to Stephen Curry’s shot. So when the light bulb went on (a rare occasion for me), I went back and watched Rick’s One Motion video again. I watched great NBA shooters in slow-motion and Rick was exactly right. I was very happy and a little frustrated that the answer had been in front of my face for all of these years, and I hadn’t been teaching it this way. So Rick then taught me the shooting progressions to help teach this proper timing between the legs and the shot motion. After teaching this, I truly believe that if you incorporate these progressions, that this alone will fix most of your shooting problems. The real beauty of teaching the rhythm, timing, and coordination of this shot motion (Tuck to Set to release) is that it helps your shooting no matter what your belief system is on the technicalities of the shot. Finger placement on ball - Index finger in the middle of the ball or two finger split between index finger and middle finger. I found when I focused more on big picture things and I stopped focusing on the little technicalities, a lot of these points became less important. These were the things I focused on. Is the ball on your finger pads? Is your shooting shoulder pointing to the goal? Are you relaxed? Is your shot fluid? Do you have proper rhythm and timing between Tuck, Set, and your release? Are your mechanics consistent on every shot? A good summation was.... are you an athletic shooter? There are many ways to successfully teach shooting the basketball and we hope that this is something you can add to your toolbox. Also, we would appreciate your thoughts on this topic. And let us know if you want us to create a video of the shooting progressions that we used to teach the Tuck, Set, and the proper timing of the shot motion. It is probably the most effective, yet simplistic shooting progression I've ever used. This is pretty much the exact method I teach my players. To help them keep a one motion shot, I tell them to imagine their legs driving their shooting elbow. As they start to straighten their legs to jump, use that same momentum to drive their elbow up to the point where the ball starts when in the set position. This all happens at the same time. When the knees are straight and the balls of the feet are pushing off the floor, the elbow is locking and the ball is being released at the same time. I realize as kids get older, the launch will come when they''re further off the floor at times. But it seems to really help (especially with younger players) when I tell them to visualize their legs and shooting elbow working together. Or, "let your knees drive your elbow" as I tell them. This article was interesting, as well as clearly articulated, and I love the breakdown of the different types of shooters. However, one overlooked aspect of Stephen Curry's shot, and all shooters is the role of the guide hand. On every shot Curry's takes, the fingertips of the guide hand rotate toward the rim as his right wrist flicks and releases the ball. Almost like a soccer player points their plant-foot at their target before they pass the ball, Curry and great shooters such as JR Smith make sure to point their fingertips of their guide hand at the middle of the rim as they release the ball. Herb McGee calls this "shooting through the guide hand." McGee actually even believes in pointing the thumb of the guide hand at the rim on the release (watch JR Smith). The guide hand also dictates the release point of a shot. For right handed shooters, I teach the release point to be at or around the right eye. If a right handed shooter is not consistent with their guide hand. Their release point ends up shifting more to the middle or their forehead or beyond which drastically alters their shot. I believe this to be one of the most undervalued and under taught aspects of shooting. We also don't think he holds follow thru long enough. I am not trying to change his form (laughable isn't it) but we would rather our kids followed a simpler, and more consistent motion of his teammate Klay Thompson. Follow thru can clean up so many problems that we really want our kids to exaggerate it as Rick Penny does in his video. Curry and JR Smith often yank it back. We much prefer to share Klay, Lorver, Reddick, James Jones as great examples. We know that Curry has everything perfect at release point, just that there are simpler, stricter paths to that situation. Love the stuff on the dip. We try and get our players to dip their hips as the ball arrives rather than after the fact. We think the dipping motion of the ball is really tied to the need for the hips to dip for rhythm and drive. Great topic, thanks for the depth. Thanks for the notes, Chris. Dipping could certainly be linked to the player dropping the hips after the catch. After reading this article I could not believe that Stephen Curry was NOT a dip shooter. I've seen many videos that shows he dips. Two still shots don't prove anything. By that logic, I can prove that Steph Curry shoots from his feet as long as I can find a still shot that shows him catching the ball at his feet. Look at the video evidence. Steph Curry approximately 95% of the time dips the ball. 1. To emphasize the importance of teaching the timing and coordination of extending the legs to jump as the ball reaches the Set Point. That way, players did not have a rushed shot motion AKA the Shawn Marion effect. 2. The second point was to introduce a more precise way to teach the dropping the ball which is called the Tuck. Never did I say that Stephen Curry didn't dip the ball. I actually said he drops the ball down to his hip in the article. However, Stephen uses the Tuck and the proper timing, rhythm, and coordination while extending his legs when the ball reaches the set point. Joe, terrific article and ideas! Right on mechanically. There is not Magic bullet, not foolproof single method of shooting the rock. There are principles that most great shooters have in common. Still it's like snowflakes, no two shooters are exactly alike. Keep up the great work and thoughtful analysis. I studied Nordland and Penny and watched video of alot of ball dipping expert shooters then decided that one way to describe the commonly good rhythm was 'ball leads body down and ball leads the body up'. Think about it and watch the really great shooters. While Penny's 'tuck to set' are only the 'up' part, i believe the getting to tuck is the same as the ball dip 'down' part for others. I first heard Joe Haefner equate the Tuck to the Dip and thought that was a great observation. The Tuck is to One Motion what the Dip is to other techniques. Both serve as a transition into the shooting motion providing rhythm and power. i think a good follow-up to this article on shooting would be the importance of positioning of the feet.... SC30 has "the turn" to make sure his hips, shoulder, elbow are aligned with the rim. Rhythm is the key. Non-dippers can get mechanical, so there has to be a consistent way to teach non-dippers not to get into their set position and hesitate, which results in them standing up before the shot. Dippers often don't get to the set position and just shoot straight from the dip. The key is not so much the tuck, but the trigger -- as soon as the ball hits your shot pocket or set position, that's your trigger to shoot. Wait too long, then mechanical and you stand up on your shot thus losing power. Start too early, you never get in your proper set position. To do this, proper movement of the shooting side forearm to get the ball into a set position is key. Then once the forearm delivers the ball to the set position, the shot should immediately begin. 1. What happens when the ball is on the shooters non-dominant side (ex: dribbling left handed for a right handed shooter)? It would be inefficient then to pick the ball up, rotate across your body to the tuck position, then up to the set position. 2. If you bring the ball into your body as you suggest in the tuck position, this will naturally push the shooting elbow out. You have to be careful to get the shooter back in proper set position. When dribbling with non-dominant hand, we teach to "pound-dribble" (just a harder than normal dribble) to set the defence off their feet as this usually makes the D back off, also this brings the ball up that little bit faster. Then when the basketball gets to aprox. waist height, really rip the ball left to right into the shot pocket (tuck) then shoot. Chapters 8, 9, & 10 of the One Motion Shooting Video explain and demonstrate how to utilize the Tuck no matter which pivot foot is used. Whether from a pass or off the dribble it's a seamless process and very efficient in movement. In fact, I've found for right handed shooters that it's easier and quicker to get the shot off going to the non-dominant or left side. Also, when using and teaching the Tuck, I haven't experienced problems with the shooting elbow being pushed out. If it does venture out, then it's being done incorrectly. Not certain this question relates to the argument "to dip or not to dip". My son is 12 and is showing signs of being an outstanding shooter. rhythm, timing, ect.... however being a right handed shooter his elbow sticks out while moving through the shooting process. most videos that I've watched mention keeping the arm in line with hips, shoulders,ect... when asked to tuck the arm he responds with an "unnatural feeling" should i be concerned or just ride it out with hopes of correction as he develops? I would only be concerned if at the time the ball is being released the elbow is not under the ball. More precisely the little finger would be in line with the inside of the shooting elbow at the time of release. Without having seen your son shoot, I can only speculate as to what your describing. Perhaps his elbow sticks out due to the way he holds the ball or his shot line is toward the middle of his body. If it "feels" uncomfortable for him to Tuck his elbow, then I'd say let him keep doing what is working. The Tuck is supposed to feel natural in that the upper arm hangs without any undue force toward the body. To me, the biggest factor for you son is if the ball is going in more times than not. If so, he must have very good rhythm so be careful not to throw that out of whack. This is a great article. Really makes sense too. I would love to see a video too. Great article. Very young players have trouble with timing and rhythm and thus missing the power wave. Also incorporating the tuck into the shooting start action sets the wrist back more thus ensuring it is under the ball nicely for good arc. Would be great to have a video of the teaching steps. Great point about the Tuck causing the wrist to be set early. This leads to greater efficiency and a quicker release. I completely agree with your point about the fingers of the guide hand rotating and pointing towards the basket. Regarding the release point, you teach it takes place at or around eye level. Could you explain that further as it seems to me the release point is much higher...I don''t want to misinterpret something you''ve said. Mr. Joe, I would like request your help or assistance with my shot. My main problem is arc, too much arc. It takes more power to shoot from father out. Also I''ve trying to get rhythm and timing with my upper and lower body. 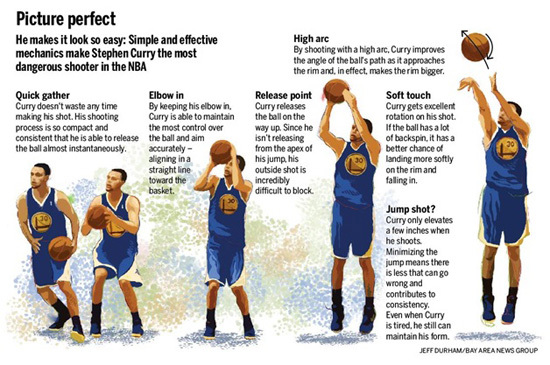 I''ve been confused because there''s a sample shot analysis that includes Stephen Curry on jump shot genie. In this shot analysis, Coach Mac says that having the knees still bent as the arms bring the ball causes a struggle between the arms and legs. He then states that Steph is having his legs straighten out as he''s bringing up the ball. However, my purpose is slightly different from the instructor in the video. 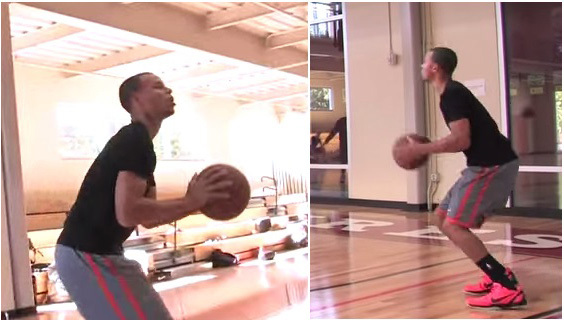 I use this drill to work on bringing the ball up prior to jumping to extend the legs. I like to do 10 reps without shooting. Then I''ll do a final rep that includes a jump and shot. I''ll do this 5 times. Do this every day for your warm up routine. I found that even though you''re stepping into your shot, it helps if you like to Tuck on your hop too. I teach and believe the ball should be released on the way up right before reaching the apex of the jump. The wrist snap or release occurs exactly when the elbow fully extends. At the release, the arm should be approximately at a 45 degree angle to help provide sufficient arc. Technically, I would say he does not "put" the ball in his "shot pocket". I would say he "transitions" through his shot pocket. I have a few questions about release timing with the legs. The travel to have the best shot was long. When I first got my teaching lesson in the middle of 60''s, it was first division player with effective beautiful shot from Finland who came to show the teen age youngster what should I do. He said: put the ball away and show me how you jump up. So I did. "What did you do, how did you do it", he said. "I just jumped" was my answer. "How did you use your legs, how did you use your arms?" was he next guestion. So I showed it again. "You jumped from the balance, you bob and bow at he same time and use your hands up to reach and have maybe some power, beautiful, but relax at the same time more", was his analyze or my jumping. He continued: "Now do the same thing with the ball in your hand, take the shooting hand on top of the ball the other hand slightly under the ball. Let the ball go before you are on the top of your jump. Hands up but shoot only with your shooting hand. AND relax your upper body, your wrist and your fingers. Wave to the ball with a good spin." Only that one time and moment he gave me that lesson. Of course as young boy I forgot most part of it. They only came back to me when sending emails with Tom Nordland some 10 years ago and looking his DVD''s. Swish is alway in my mind and mostly in my ears when I am looking and hearing my own player shooting. Sorry to say that I was listening too much of American coaches, about the "wide legs", "index fingers", "elbow position", ball over your head, "look at the ring" etc . I did forget in my playing carreer, how easy the fundamentals of basketball are. To me shooting, push passing and also fundamental dribbling are the same hand motion. Relaxed wrist, ball on fingers, relaxed upper body, good balance, good abs and back muscels. Let it fly baby, do not force the BB and it will give you Swish ="Nothing but net"
Your description of the shooting motion was very poetic and spot on. Well done! This is also a great post for teaching youth players where the problem is that they've been shooting at too tall baskets or from too far out ('cause hitting a 3 pointer is so cool!) and using a "dip" to add extra power to their shot and it ends up being one motion, but from the hip, often causing them to fly forward (body following the motion). Obviously, this becomes problematic if you have a defender standing right in front of you - not to mention the accuracy issues. I've been struggling at how to communicate this change and loved these series of videos breaking down tuck, set, and release. A big part of it is actually a subtle weight shift from the slightly forward leaning "tuck" to the more upright position of set and release. It's like the difference between a box jump rather than a standing broad jump. 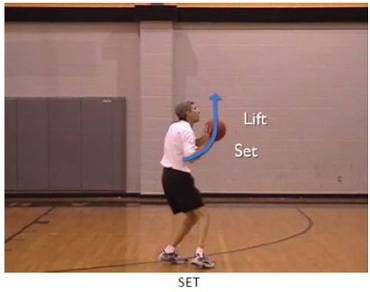 Then, your motion is going up through release instead of forward toward the hoop. Thanks for all your great tips! Shooting 3's is definitely the "cool" thing to do these days. With One Motion, the "dip" isn't necessary as it slows the shooting process down. Initial power comes from the legs or knees going down and up quickly (Quick Hop). As this happens, the ball rises creating excellent timing. No doubt the "dip" provides extra power, but it also causes the leg action (down & up) to be slower. Since the ball usually starts at or below waist level, it has farther to travel up the Shot Line towards the Release Point when compared to One Motion. Timing with this method naturally causes the leg action to be slower in order to give the ball time to rise. Proper timing creates power and rhythm resulting in a shooting motion that feels effortless. You made an great observation regarding the subtle weight shift from leaning slightly forward at Tuck to becoming more upright at SET on into the Release. That will be cool if create a video of the shooting progressions that you guys used to teach the Tuck, Set, and the proper timing of the shot motion. Hello, was hoping to get in touch with Rick here for a quick question. I was browsing through shooting workouts and was wondering if you have anything a little bit more advanced? I make 80% of my wide open 2s so shot consistency is something I feel I have worked very hard at and succeeded in. I currently run through a shooting progression almost identical to Ray Allen (and have for at least 10 years). I am a D1 player with NBA hopes and am looking for some next level workouts to sharpen my skills. Thanks in advance! AJ, where are you located? I might know a trainer in you area to help you. One of my good friend Don Kelbick taught me that the NBA guys don't do workouts much different than a high school player. He's trained a few dozen NBA players. The only thing is that they do the little things better. Create an objective and find exercises that help you accomplish that. Do you know your strengths and weaknesses? Can you make your strengths even better? What is something you could add to complement your strengths? That way, if they take away your strength, you have a counter. As usual, Joe has provided great advice and excellent resources for individual workouts. 1. When shooting, strive to improve your focus/concentration when locating your target, e.g., front of the rim, back, middle, etc. Greater concentration on the target will improve your results dramatically, especially when guarded closely by a defender. Too many times shooters pay attention to the defender and lose focus on the target. I'm talking intense focus like that of a laser beam. Noting distracts you as your locked in! 2. Be sure to relax through the shooting process when being defended and don't rush things...be quick & smooth. 3. Expect to make every shot. 4. Quickly move on to the next shot after missing...never spend one second thinking about it. The NEXT shot is the most important shot in basketball! 5. You can be the best workout warrior, but never get the results you desire in games. Be sure to calm your mind on offense, focus like a laser on the target, and develop that quick & smooth release. Before shooting, you should feel the adrenaline start to flow in anticipation of the pass coming your way. It's got to be a feeling of "I want the ball". Successful shooting in games is more of a "mental state" than one of mechanics. If you've neglected that phase, do some mental imagery by picturing yourself in games having success. Rehearse ahead of time and the actual process will be that much easier. Yes, I would very much like to have you to create a video of the shooting progressions that you used to teach the Tuck, Set, and the proper timing of the shot motion. Please make it in a dvd format - I much prefer dvds. Also is there any place I can order a dvd of Rick Perry's One Motion video? Hello coaches. I have a question about the Tuck. Is it possible to do it easily with a two piece shot? I do have pretty good mechanics (thank you guys for that free e-book!) but the Tuck looks like it is more in the realm of a one piece shot. I believe the dip is relevant, due to 2 factors: timing and rhythm. Without the dip, the jumper lacks both, based on my experience and observation. Also I like the shooting elbow to be in front of the wrist at the set point, not directly under the ball. This reinforces the jumper to be an actual "shot", rather than a push. Just my humble opinion, thank you for all the great tips! I agree, the dip does provide timing & rhythm. It's the trademark of two-piece shots and a vital ingredient for that technique. I disagree with your assessment that, without the dip, the jump shot lacks both. Just the opposite is my observation based on 14 yrs. of teaching shooting and using the One Motion technique my entire life. Melissa Dixon, former Iowa Hawkeye, is the career leader in 3-point shots made. Great timing and rhythm! Elle Ruffridge, recent grad of Pocahontas HS in Iowa, is the State All-Time leader in points (2,879) and 3-pointers made (452/1003 = 45.1%). Outstanding timing/rhythm! Both have One Motion (one-piece) shots with deep range and neither dips. Check out YouTube to see them in action.